Hi everyone, today I am back with another one of my top favorite series. If any of you know me then you would know that I am a huge candle hoarder! I love Bath & Body Works candles and they have my favorite candles on the market. I have close to 100 candles by now to be completely honest. I love how every season they are constantly bringing out new scents along with some of their most famous signature scents. I'm constantly popping in their store to see whats new. I have so many favorite candles of theirs and I really want to keep these kinds of posts to a minimum. I decided for today I wanted to share some of my favorite candles for summer time. In the future once each season approaches I will make a post dedicated to my favorite fall candles, followed my winter then spring which should be fun. I am going to start off with my most favorite candle ever which is Peach Bellini. Of course this is my all time favorite candle of theirs I love everything peach. Bath & Body Works carry different peach scented candles but this one is my absolute favorite. There's just something about Peach Bellini every time I smell this candle it feels very refreshing. The peach scent is very strong in my opinion but that's why I love it so much. The other peach scented candles they carry are more subtle and this one is a splash of bubbly peachiness. I think the reason why this candle has such a burst of peach scent because it contains orange and mandarin and I love those two scents. If there is a candle I would highly suggest anyone to purchase from Bath & Body Works it would be this one! B&BW are always re-releasing this scent so it always in a new and different packaging. The packing of this candle is actually from a collection they released last spring so just keep an eye out or ask an employee to show you where they are. Notes: white peach, sweet orange peel, yellow mandarin, jasmine with a pop of blackcurrant. There is no surprise here that my second favorite is another peach scent. This is Georgia Peach which smells of a delicious juicy peach. This candle unlike Peach Bellini is a much subtle scent also a bit sweeter. This scent is so simple and heavenly not at all over powering either, that is one thing I do not enjoy when my candles are too over powering in fragrance and overly sweet. This candle is perfect for a nice wash of sweet peach throughout your house. 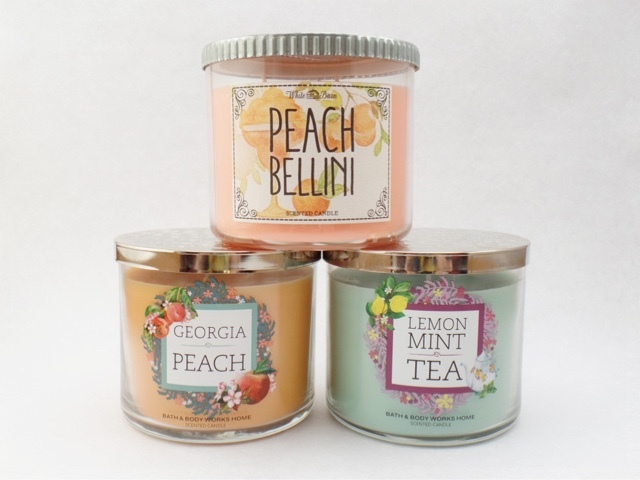 Every time B&BW is having a candle sale I will purchase either one of these two peach candles and trust me when I say I have tons as back ups. Notes: Georgia peaches, dewy petals, hint of vanilla. For my third favorite candle, this is one of the newest candles I was introduced to and I even spoke about it on my spring essentials post. I am talking about the Lemon Mint Tea candle. Back in March was when I first noticed this candle mainly because of its cute packaging. I didn't usually gravitate towards lemon scented candles just because at the time I was not a fan what so ever of anything lemon. Every time I would go into the store I would find myself sniffing it and then I'd put it down. Randomly one morning I woke up with the urge of needing that candle in my life and I am so happy about that. I am so obsessed with this candle that it is actually coming to a close tie to Peach Bellini. This candle is so fresh because of the lemon and smells so clean. I already have a few stocked up for back ups that is how much I'm loving this candle. Every time I finish cleaning my room floor mopped and all I light this candle up and my room smells and feels extra clean. This candle is perfect for summer and even spring which was when I most burned it. I can also have this candle burning all day without getting tired of it. This candle like many other of theirs is always being re-released and it recently came out in new packing and name. Its still very similar its just labeled as Lemon Mint Leaf. I have been really into lemon scented candles lately. Notes: spearmint leaves, zesty lemon, verbena. I was a bit hesitant of even sharing this next candle only because it hasn't been re-released, unless I haven't noticed it. This candle was released last year it even has the same packaging as the peach Bellini and I'm assuming this was one of their one time launch scent which is sad because it's clearly a favorite of mine. This is the Cherry Blossom Sangria and this candle is filled of fun scents. This is more of a fruity scent yet not over powering at all. As soon as I open up the candle I can smell the deliciousness of the cherry and raspberries! This scent is perfect to have burning on a nice warm afternoon while you are relaxing. Notes: cherry nectar, apple slices, wild raspberries. My last candle is a one I'm surprised I'm even including in my top five favorites since I don't like anything coconut scented. I think the reason why I like Tiki Beach is because once again this scent is very subtle and not over powering. Its strange to think that a candle can make you feel warm just by its scent. It smells very tropical and clean all at the same time. This is also another candle that I have purchase countless amount of times and had few back ups. This candle like all the rest of the ones I've shared today are a staple in my collection or obsession which every you'd like to call it haha. Notes: vanilla musk, orchids, toasted coconut. I would love to share some alternative brands other than Bath & Body Works because I have heard people say their candles are overpriced but this my favorite candle brand. I also never purchase their candles unless they are on sale for 2 for $24 which they do very often and they always send me coupons along constantly sending coupons out to my email. I always save my $10 off coupons for when the candles are on sale that is when I make sure to stock up! If there is any candles you guys absolutely love please feel free to share I would love to try some new scents out. I love b&bw candles and I also only buy them when they are having a sale. Every time I see peach candles it reminds me of you. I love the design on the Peach Bellini and the Cherry Blossom Sangria. 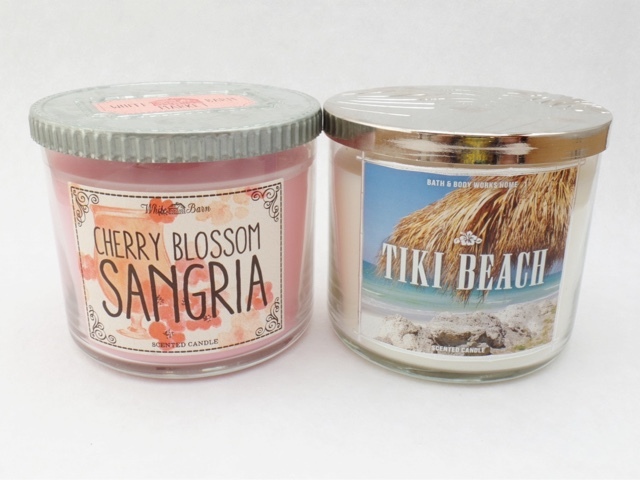 I've never seen that Cherry Blossom Sangria candle. P.s Ooops, I accidentally commented first not knowing I'm logged in with my work account. They're so cute, they're always coming out with cute packaging. Ugh the Sangria candle smells so good I really wished they brought it back.